Delicious chocolate stuffed cardamom buns goes well with your coffee or tea. This post is part of Choctoberfest, which is basically a virtual event in which bloggers share their chocolate recipes throughout the week. As readers you get a chance to win some delicious chocolates ,sugar and other exciting prizes. This post contains Affiliate links. When I was doing research my professor used to say that all major inventions come through accidents. Yes I made these delicious buns also by an accident. I was planning to make Swedish cinnamon buns using the recipe from the book “Bread by Global baker Dean Brettschneider”. Recipe asked for bread flour, however I accidently took all-purpose flour and only realized my mistake half way. And I ended up making these chocolate stuffed cardamom buns. Hubby told me to throw that and make another batch. However I didn’t feel good about throwing away all the dough, so made these chocolate stuffed cardamom buns. What I like about this book is that measurements are so correct and whether you use metric or American you will get same result. I tried one more recipe from the book which I liked very much and I am going to blog about it soon. 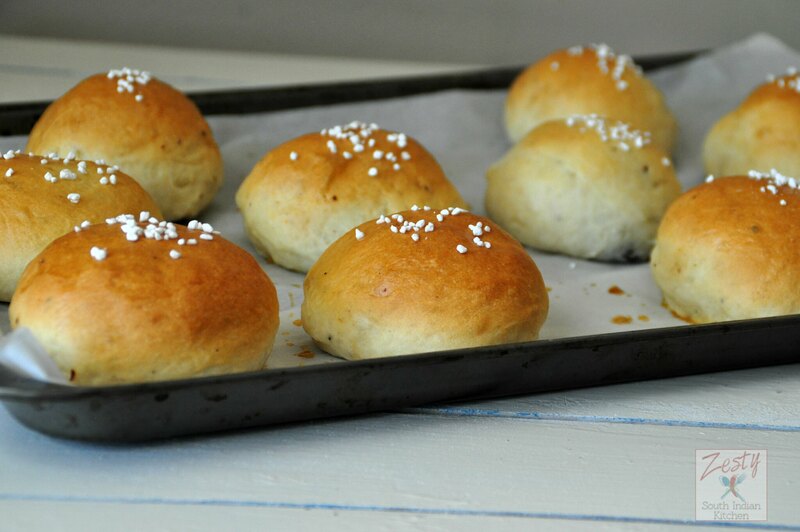 I also need to make Finnish Pulla bread which is festive one. I have tried Norwegian cinnamon buns earlier and blog about that Here is the link. I need to try rest of the cinnamon buns from Scandinavia. When I thought of making chocolate stuffed cardamom buns, two methods comes into my mind, one is just stuffing with chopped baking chocolate. Other one is to make chocolate ganache and then stuffing. Since I was in hurry I opted for the one method with just baking chocolate, I used semi sweet baking chocolate, as I know the dough is not too much sweetened. Since I had not used pearl sugar in any recipe for a long time, after the egg wash I decide to add that. If you don’t have it in your hand you can just try with turbinado sugar. This is an easy recipe, first you need to make buttery dough and then stuff your favorite chocolate into it, set aside for few minutes for another rise and bake enjoy with your coffee or tea. It is a great treat if you like both chocolate and bread. #Choctoberfest is a virtual event put together by The PinterTest Kitchen . Bloggers from around the world will be posting their favorite chocolate recipes through out the week. and you’ll get a chance to win some awesome prizes. What’s not to love? #Choctoberfest would not be possible without our sponsors, starting with our 2015 Gold Sponsor, Imperial Sugar. You can find Imperial Sugar on Pinterest, Facebook, Instagram, Twitter, and more. Make sure you visit the recipes section of their website for some sweet inspiration, and you can also find coupons on their website if you want to try out Imperial Sugar yourself. We also have a nonprofit sponsor this year – Rescue Chocolate! They make vegan chocolate treats and donate 100% of their proceeds to animal shelters. Enter now to win the #Choctoberfest prize. Hurry, because we’re picking the winner on October 12 at 8:00 AM, so if you don’t sign up before then, you’ll miss your chance! Check out the blogs participating in #Choctoberfest 2015. Please check for chocolate recipes throughout this week. The PinterTest Kitchen • 2 Cookin’ Mamas • A Day in the Life on the Farm • Aloha Flavor • Amy’s Cooking Adventures • Angels Homestead • Balancing Motherhood • Bless this Mess • Busy-at-Home • Chocolate Slopes • Coconut & Lime • Colie’s Kitchen • Cookaholic Wife • Cooking In Stilettos • Cooking With Libby • Cookistry • CopyKat Recipes • Cravings of a Lunatic • Crumbs in my Mustachio • Culinary Couture • Cupcakes Take The Cake • Deliciously Savvy • Eat It & Say Yum • Fairyburger • Famished Fish, Finicky Shark • Farm Fresh Feasts • Food Hunter’s Guide to Cuisine • Full Belly Sisters • Get Off The Couch and Cook • Grumpy’s Honeybunch • Hey What’s for Dinner Mom? • Honey and Birch • I Can Cook That • Jane’s Adventures in Dinner • Jessie Weaver • Life on Food • Life, Love, and Good Food • Majorly Delicious • Moore or Less Cooking Food Blog • Mother Would Know • Or Whatever You Do • Poet in the Pantry • Recipes Food and Cooking • Rhubarb and Honey • Sassy Southern Yankee • Savory Tart • Seduction in The Kitchen • Serena Lissy • Sumptuous Spoonfuls • Take Two Tapas • That Skinny Chick Can Bake • ThatsSoYummy • The Chonchudo Files • The Crumby Cupcake • The Dinner-Mom • The Saucy Southerner • The Spiced Life • The Spiffy Cookie • The Two Bite Club • The Weekday Gourmet • Vintage Kitty • Wendy Polisi • What A Girl Eats • WhitBit’s Indian Kitchen • Wit Wisdom & Food. Zesty South Indian Kitchen Are you a blogger who is interested in joining us during our next community event? Sign up here now! We’ll make sure you get an email about our next blogger event. 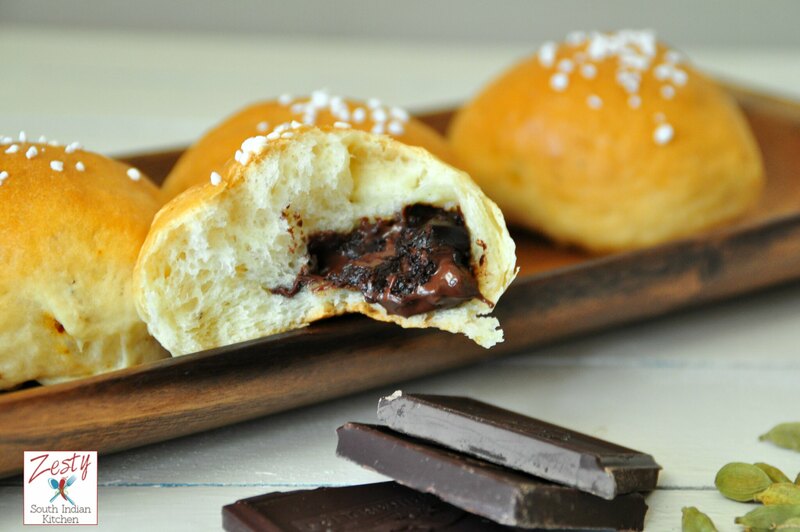 Here comes the recipe of delicious chocolate stuffed cardamom buns. Hard to stop with one. Delicious chocolate stuffed cardamom buns goes well with tea or coffee. and little flour and milk to form slurry. and mix well to form smooth dough. Rest for 5 minutes then knead again to soft and smooth dough. and set aside for double it will takes about 45 minutes. In the mean time chop the baking chocolate into small pieces and set aside. Once the dough is doubled in volume transfer to work area and divided into 10 equal pieces. and shape it into smooth balls and place it in parchment paper lined baking sheet.
. After 20 minutes of second rise preheat the oven to 350F. When you are ready for baking does an egg wash and sprinkle with pearl sugar. You can also use turbinado sugar if you want. 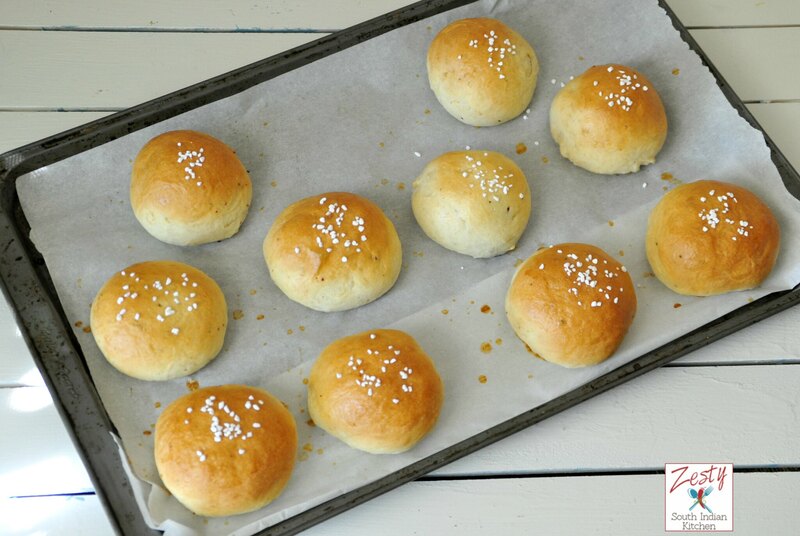 Bake for about 19-20minutes or until buns becomes golden brown color. Remove from the oven and enjoy when it slightly warm. Absolutely gorgeous chocolate buns, Swathi! Sharing on Facebook, and pinning! These remind me of the chocolate filled brioche rolls we used to buy at the nearby bakery! So beautiful, so delicious!!! Well done, my friend!!! You sold me at cardamom, I’m a bit addicted to that spice. 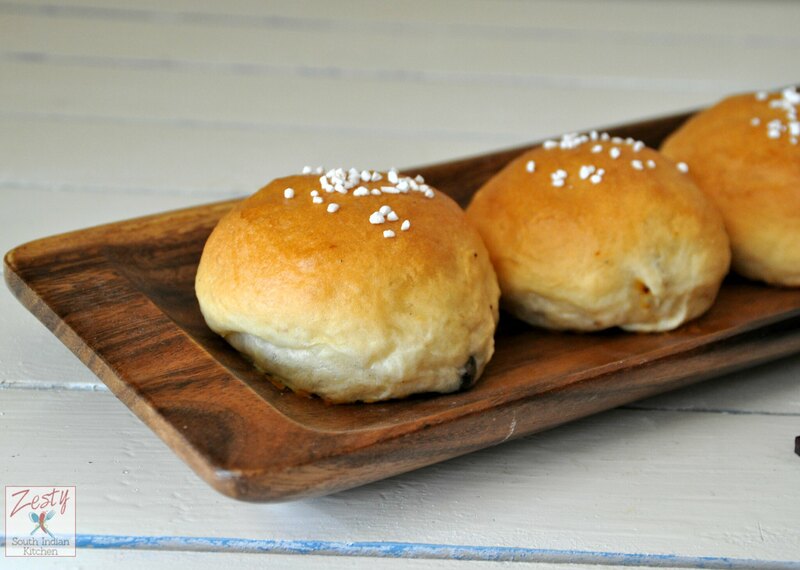 looks super delicious Swathi…I love chocolate stuffed buns …love that you used cardamom powder….. These chocolate cardamom buns look super YUMMY! OMG Swathi – these look sooooooooooooooooo YUMMY !! Oh my gosh, chocolate cardamom? What a great combo! And love the creativity of stuffing it inside of a bun instead of a pastry. OMG Swathi…these buns are amazing! I would so love to be biting down into one of them right now and have that chocolate ooze out. YUM!